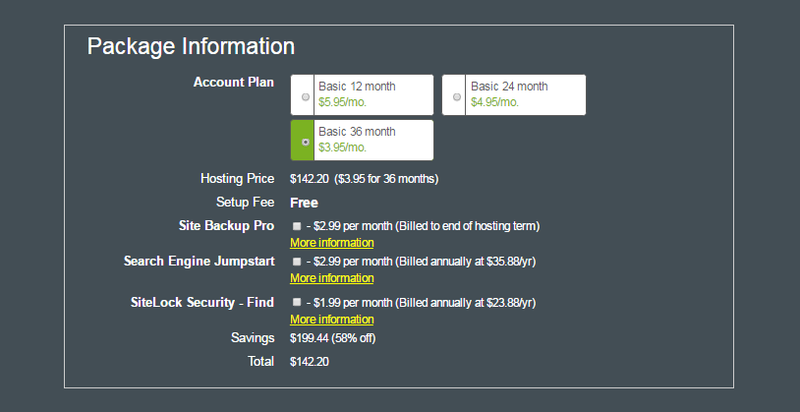 Hostmonster shared hosting basic plan is regularly priced at $9.49 per month. But the company is running a special promotion to offer the same plan at just $3.95 a month. Click on the link below to access this Hostmonster discount coupon. Hostmonster has been providing web hosting services since 1996, which makes it one of the veterans in the industry. It is an American company with headquarters in Provo, Utah and was acquired by Endurance International Group, making it a part of a ring of web hosts under the EIG umbrella. Host Monster specializes in affordable shared web hosting solutions, though the company also offers VPS and Dedicated Server hosting. Hostmonster hosting has gained popularity among individuals and small to medium size businesses looking for cost-effective yet powerful web hosting with good support. A major selling point for the company apart from affordable solutions is all American zero-outsourced support. All the unlimited basics like diskspace, bandwidth, email accounts, addon-domains etc. are also included in their hosting plans. The basic shared hosting plan which regularly comes at a price of $9.49 per month is currently being offered at just $3.95 per month for our visitors. 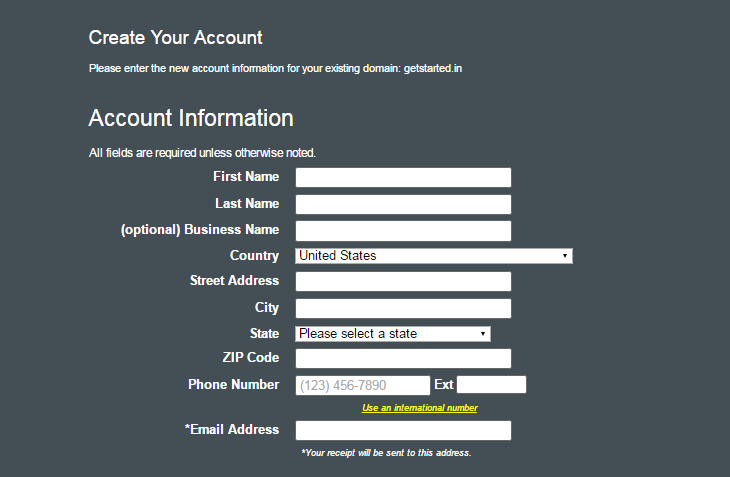 This also includes a free domain name that you can use as long as you choose to stay with Hostmonster. To activate this discounted Host Monster pricing, just click on the link below and complete the hosting purchase. 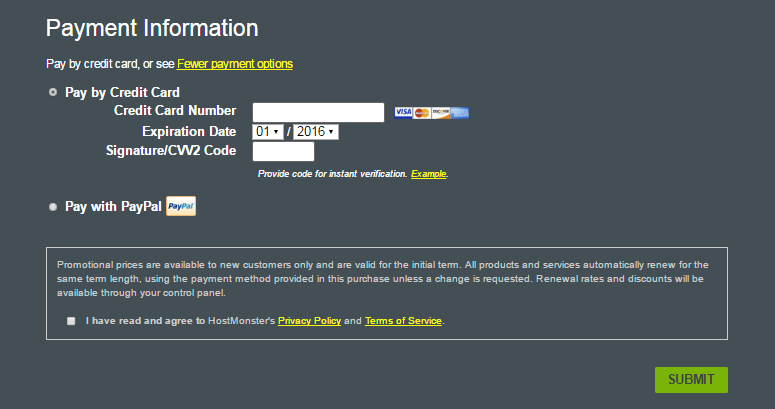 You may refer to the detailed instructions below to sign up on hostmonster.com. Click on the “Claim Our Hostmonster Promo” button above. It will take you to hostmonster.com website and activate the $3.95/mo pricing at 60% discount. Click on the “SIGN UP NOW” button to start the signup process. Next you will be presented with option to select your hosting plan. 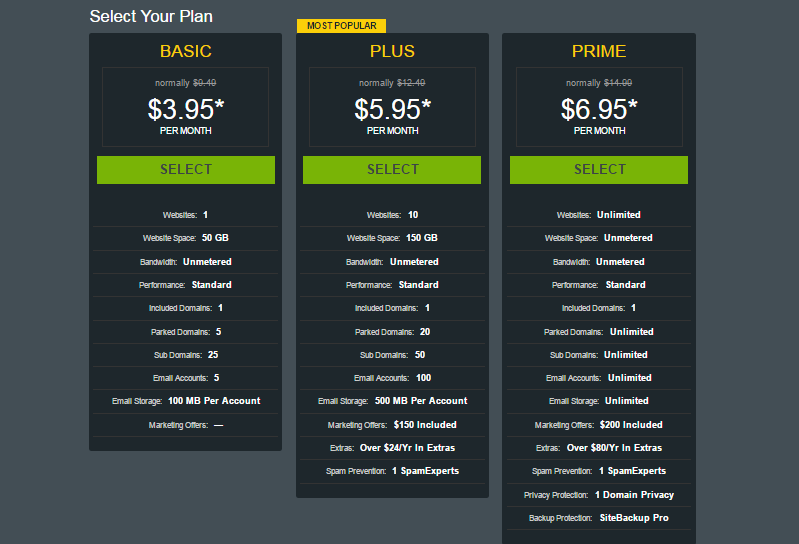 Three shared hosting packages are offered – Basic, Plus and Prime. If you want to host only 1 website with minimal requirements and limited expected customer visits, you may go with Basic plan. Or you may pick either of Plus or Prime packages based on your requirements. Just click on the “SELECT” button under the hosting package that you want to buy. Register a new domain name – To claim your free domain name provided by hostmonster, type the domain name you want in the box provided in “I Need a Domain Name” section and click on “NEXT”. If you already have a domain name that you wish to use, simply type it in the box in “I Have a Domain Name” section and click on “NEXT”. Next you will need to create your account with Hostmonster. Just enter your Name, Address and Contact details (Phone and Email Address). After entering the account details, scroll down to package information section and choose the account plan. You can choose from 12 month, 24 month or 36 month term. You will notice that Hostmonster offers better discount if you go for 2 year or 3 year terms. We advise our readers to lock in maximum savings with 3 year plan, as any renewals happen at the regular rates. No setup fee is charged. You may select any additional features like, Site Backup Pro, SiteLock Security or Search Engine Jumpstart if you wish. On the next page, make the payment to complete the signup process. Once your purchase is done, you will receive an email with details of your account and control panel login information.